I've had a ton of blog ideas swimming around my head these last couple weeks, you would think this would be a good thing for a blogger but for someone like me who wants to do it all and do it immediately, this can make things complicated. Just ask Wren about what it's like to put up a Christmas tree with me ; ). I've been planning a mustard post for over a month now and set aside time to make the recipes this weekend but a combination of ill planning (seeds must be soaked overnight) and misreading directions (dry seeds not wet seeds are ground to make powder) I created a large jar of spicy, sweet, weird and uneatable mustard that continues to sit on the counter because I can't seem to give up on it and throw it out. My mustard fail looked like this. I have not given up on mustard yet, mainly because I have another awesome post that ties in with these wonderful dipping sauces, so be on the lookout! In the meantime I've decided to do what I know best this week and keep it simple, make dishes that I feel comfortable with and enjoy them as they are. 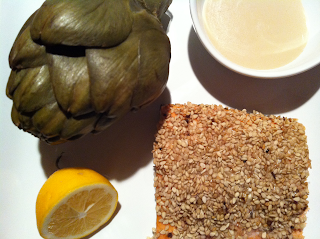 We had a really basic yet delicious meal for dinner the other night that consisted of sesame crusted baked salmon, wild rice, and steamed artichokes. These were the first artichokes of the season that I had cooked up and it was a pleasant reminder of the earth's ability to create wonderful eats that can be enjoyed simply. While plucking our artichoke leaves and scraping away the pulp with our teeth, we started discussing how the discoverer of artichokes would have ever thought these spiky tough leaved plants might be edible. I mean they don't look as appealing as say a strawberry or broccoli, and I doubt on the first time around they thought oh these would be wonderful if I steamed them and only ate the "meat" off of the leaves. And after figuring all of that out, how in the world did they decide to scrape away the fuzzy choke and eat the heart! 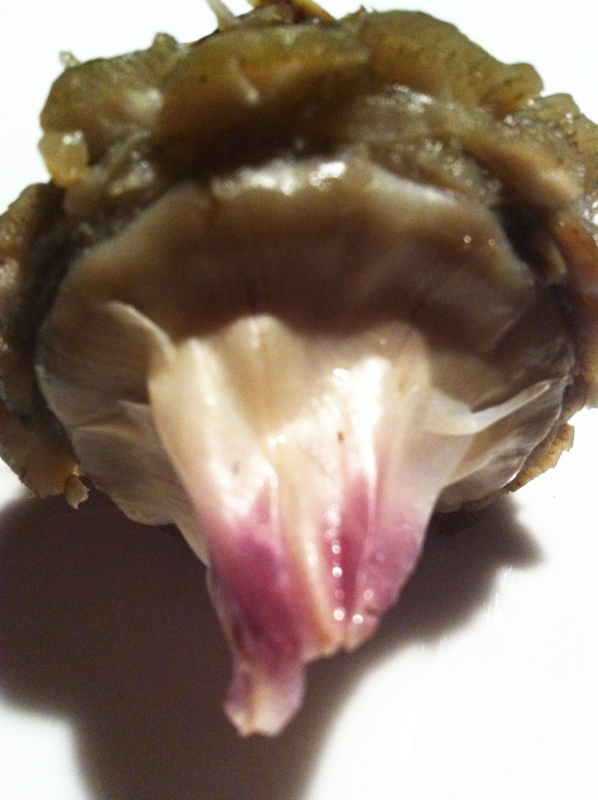 Ah the artichoke heart, how I love thee. Maybe it is the energy that it takes to get to the heart that makes it so much more savory and desirable or maybe it is because it is soft, delicious and uniquely flavored. 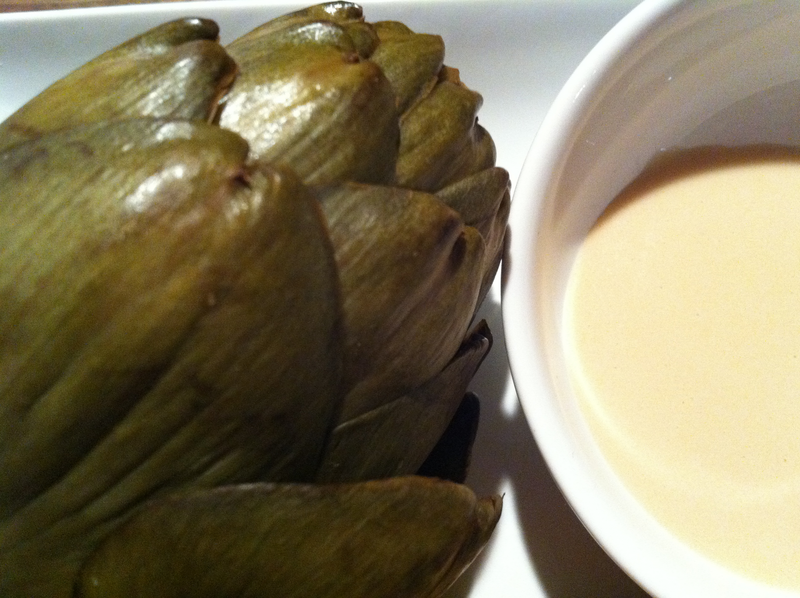 Whatever it is, I am sure it took many attempts before the artichoke eating process became understood and I would like to thank those first discoverers for taking the time to do so because I love truly enjoy this unique vegetable! If you are looking for something different beside butter to dip your leaves into I made a really easy and healthy yogurt sauce. Combine all ingredients in a bowl and whisk together, chill before serving. Eat your heart out! Delicious, simple and healthy dinner - the yogurt sauce was excellent! The nice thing about artichokes is that they keep for a quite a while - these had been lingering in the fridge and they cooked up perfectly. Must be the spiny shell that keeps everything happy inside. I also liked how we steamed them using the rice cooker steamer basket while we made wild rice - cut down on the clean-up too!